Galashiels Remembers' 'Angels Wings' ceremony on Sunday evening. Compered by Alisdair Hutton and featuring music from the town band, pipe band and Langlee Choir. The photos of the world war one dead were beamed up on a big screen beside the memorial. A month-long programme of special events came to a stunning climax on Sunday as Galashiels remembered its war dead in one of the largest weekend-long acts of remembrance the town has ever seen. The ambitions project, Gala Remembers 2018, pulled together by a number of community organisations to help remember, in the most public way yet, the 639 Galashiels men killed between in the 1914 and 1918 conflict. The parade observes a silence as flags are dipped. Led by community group Energise Galashiels Trust, the project included exhibitions, lectures, film screenings, live music, light displays, street art and acts of remembrance. A one-off Festival of Remembrance concert sold out the Volunteer Hall on Friday night, and the Royal British Legion Scotland’s remembrance parade on Sunday was larger than ever. The commemorations ended with a special Angel’s Wings service that evening, for which more than 200 people gathered to see the town’s street lights turn off revealing the shadow of wings behind the war memorial’s stone angel, only visible in a certain light. 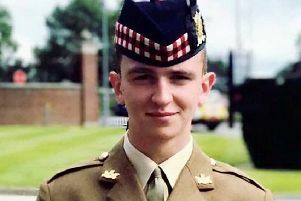 Compared by Alasdair Hutton, the ceremony featured Galashiels’ town and pipe bands and Langlee choir, and photographs of the town’s war dead shown on a big screen. An act of remembrance concluded with a prayer by Rev Michael Scouler. Councillor Mark Rowley, Scottish Borders Council’s executive member for business and economic development, added: “I am delighted to hear Gala Remembers 2018 has enjoyed such a successful year. “A huge amount of hard work has gone into the programme from various community partners, and I am pleased the Council was able to support the project which brought people to Galashiels and the Scottish Borders. “We are at the start of an exciting new journey for Galashiels, with the regeneration of the town through various projects such as the new national visitor attraction for the Great Tapestry of Scotland, the Galashiels Masterplan and the Galashiels BID initiative.